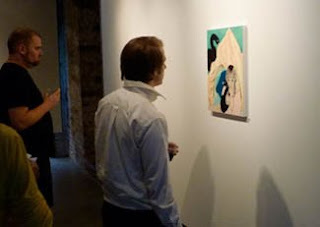 On September 10th, artist Ann-Marie Manker unveiled her recent body of work, Softcore War. Viewers were confronted with intriguing paintings and sculptural installations that revolve around the daydreams of a young female would-be suicide bomber. 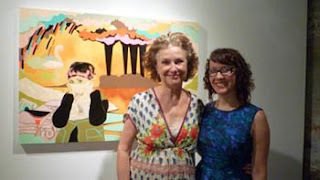 Whitespace owner Susan Bridges with artist Ann-Marie Manker. 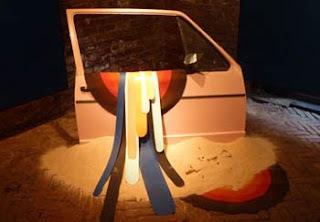 sculptural installation: 1981 VW Rabbit car door, fabric, paper latex, sand. sculptural installation: paper, acrylic, wax, rope, sand, flour. 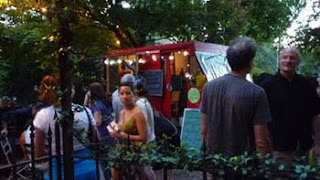 The Good Food Truck provided delicious bites! The drawings and paintings of Ann-Marie Manker explore psychological narratives through the representation of figurative imagery within fantasy landscapes. Her new body of work focuses on the daydreams of a young female would-be suicide bomber. 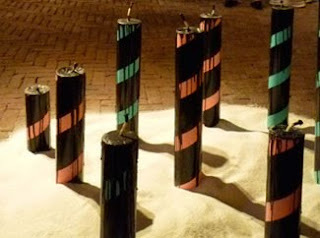 This entry was posted in Ann-Marie Manker on September 22, 2010 by Whitespace.